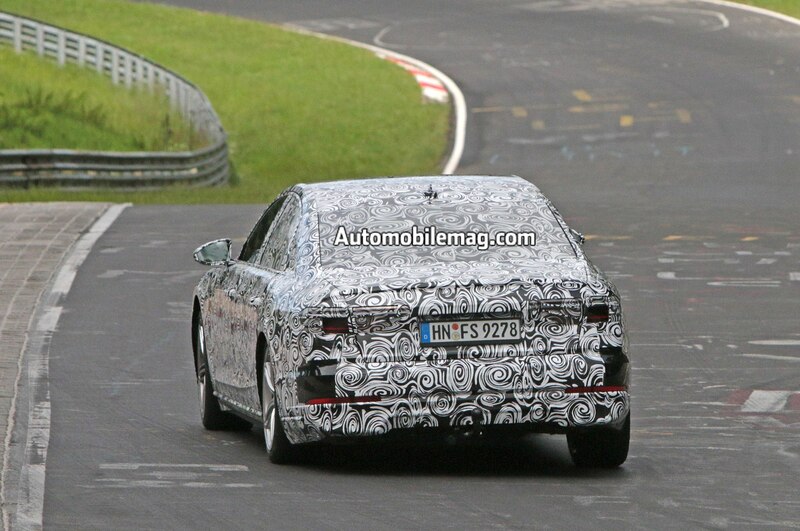 The fourth-generation A8 will feature a mild hybrid powertrain as standard equipment, Audi has confirmed. 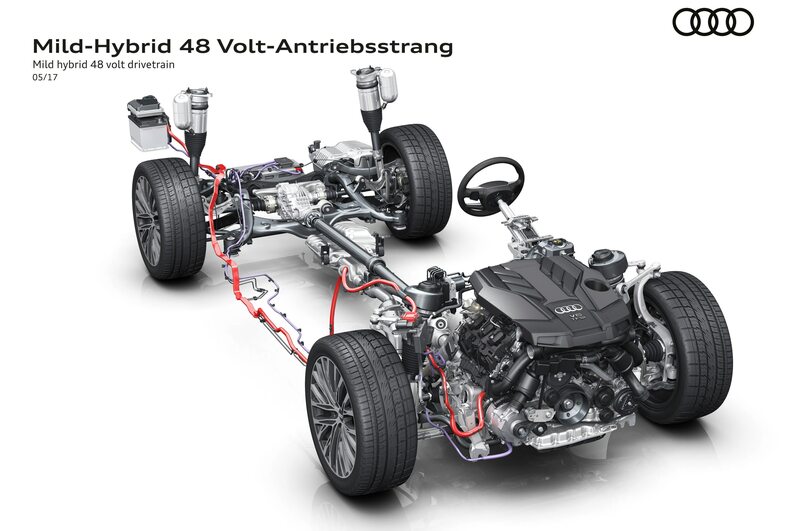 Audi released an image of the new mild hybrid drivetrain, but we’ll have to wait until next month for the full unveiling of the new flagship sedan. 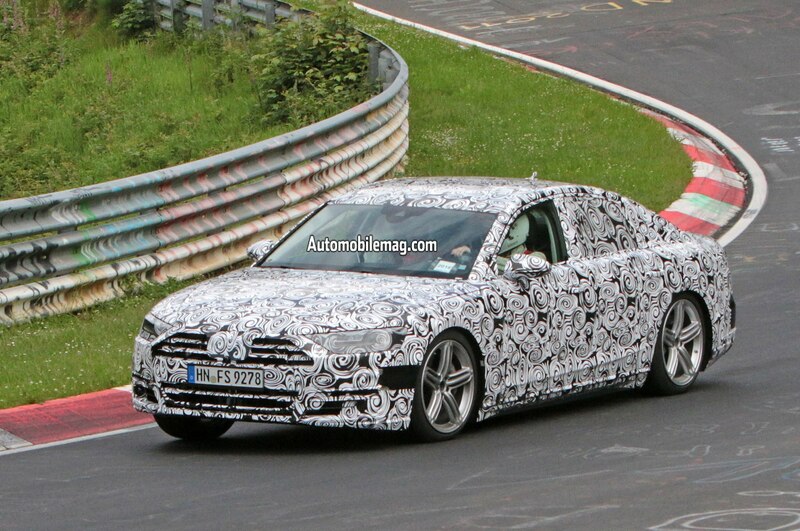 The new Audi A8 will feature a 48-volt electrical system with a traditional V-6 TFSI combustion engine. There is a 48-volt lithium-ion battery located in the trunk compartment, and a water-cooled belt alternator starter up front. The BAS complements a conventional pinion starter and is permanently connected to the combustion engine. With the system, energy is recovered during braking and stored in the battery. The A8 can enter coasting mode while traveling at speeds between 34.2 mph and 99.4 mph, and it can continue coasting for up to 40 seconds with the engine turned off. Once the driver steps on the gas again, the BAS brings the engine back up to the desired speed without delay. The A8’s start/stop function is different from other systems. It has predictive convenient starting, so that as soon as the vehicle in front of the A8 moves, the engine starts even if the driver is still pressing the brakes. That way, the car is immediately ready to go. According to a report from Automotive News, Audi’s Alexander Kruse revealed the system will expand to other large models in the lineup. We previously saw a mild hybrid powertrain for the Q8 Sport concept, and it’s also expected to arrive on the A6 and A7. Kruse, who is in charge of mild hybrid systems for Audi, says smaller vehicles will get a lighter, more conventional battery rather than the 48-volt unit in the A8. 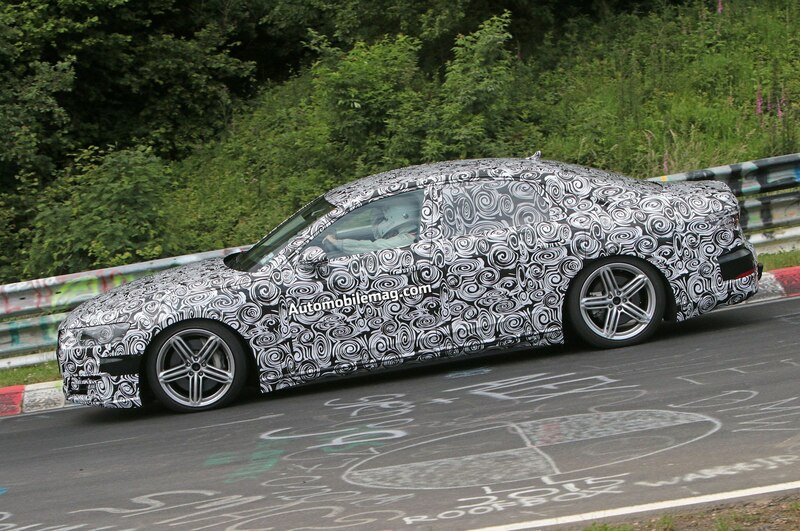 The next-generation Audi A8 will debut July 11 at the first Audi Summit in Barcelona, Spain. The model is expected to feature a Traffic Jam Pilot feature allowing the car to drive autonomously up to 37 mph.